Members of Students for a Democratic Society protest President Donald Trump's policies on Wednesday, March 8, 2017. 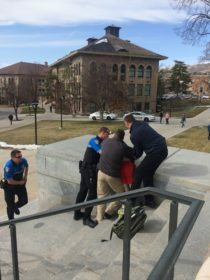 A protest at the University of Utah opposing the policies of President Donald Trump turned violent on Wednesday when an altercation occurred between a member of the U’s Students for a Democratic Society (SDS) and a Trump supporter. The march began at the Marriott Library with a short speech by a member of SDS explaining the reasons for the march. 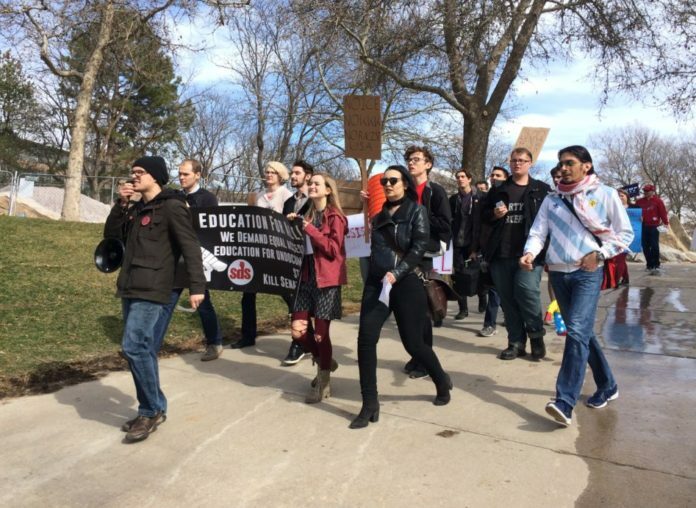 The group sent an email to members earlier in the week describing the event and listing demands for the U’s administration. SDS called on the U to become a sanctuary campus, hire an attorney to protect undocumented refugee students, not cooperate with Immigration and Customs Enforcement (ICE), as well as release a public statement outlining these actions. 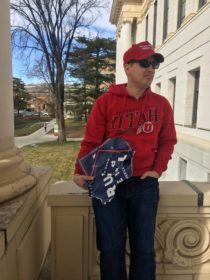 [/media-credit] Trump supporter holds the remains of his Trump-Pence campaign sign that was ripped up by a member of Students for a Democratic Society at a protest on Wednesday, March 9, 2017. The back and forth between the two parties went on for over an hour. Tensions built and at one point the Trump supporter began waving his sign in the face of one of the protesters. The SDS member then ripped up the sign. “That’s when the Trump supporter proceeded to grab [the protester] and started pushing him and hitting him in the face and the chest,” recalled Katherine Blackett, one of the organizers of the rally. Both of the men involved were escorted outside by security where they were met by campus police. Words were exchanged between the anti-Trump protester and an officer, which resulted in him getting arrested. Some members of SDS that followed them outside voiced their support of the arrestee and said they had an attorney on standby. [/media-credit] A member of Students for a Democratic Society is arrested at a protest on the University of Utah’s campus on Wednesday, March 8, 2017. The Trump supporter was escorted from the premises, but was not arrested. Security was on the scene before the altercation began at the request of the Park Building administration. Multiple authorities tried to convince the demonstrators to leave by threatening them with arrest because of the disruption they were causing. The protest continued in the main lobby despite requests from administrators and other Park Building employees that they leave. The rally, which involved chanting through a megaphone and banging on buckets, echoed off the walls and could be heard throughout the building. Why didn’t the police also arrest the Trump supporter? Are they biased pro-trump or pro-reilgion? Because of the words exchanged, as mentioned, and probably due to the fact they started the conflict by ripping up the property of the other.